One of the best way to get the maximum bass per watt is a vented enclosure! 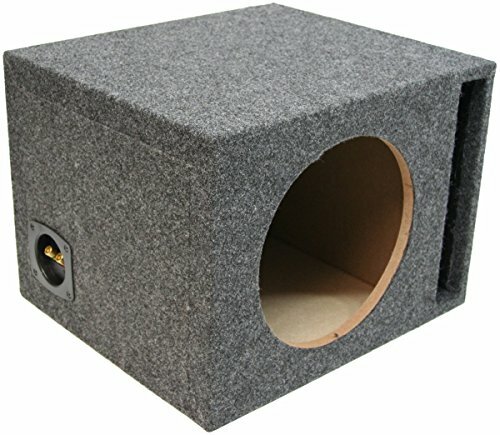 This single 12" enclosure will work with almost any brand and model subwoofer(s) just be sure to check the recommend airspace required. Unlike a sealed box the vent allows air to freely move in and out of the box but is "tuned" to a set frequency range that greatly increases the overall output. More air = more bass! Our boxes are made from precision cuts of MDF. They are then liquid nailed, nailed and completely sealed. We then wrap them with high quality carpet that matches most vehicle interiors. All Boxes feature high grade spring loaded terminal cup(s) for the absolute best connection possible. All the custom series enclosures are made to fit precisely into your vehicle to the get the max performance from every extra inch of wasted space. We guarantee you will not only see a difference in the quality of the boxes we build, but you will hear the difference and that is what is it is truly all about. Dimensions: Width 18-1/4" x Height 13-1/4" x Depth 16-1/4"